As we all know, redstone can be a very useful tool for make basic things in Minecraft more complex and intricate. For beginners to redstone, today's article will give you a basic understanding of how it functions, as well as its many uses. 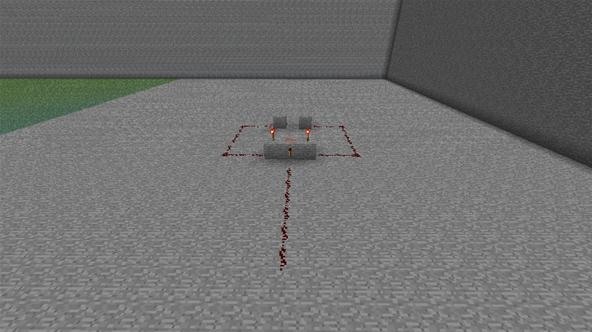 The first thing you must understand about redstone is that it must be sent into it through a pulse. There are only 5 options or pulse machines, and each do it in a different way. The first is a Lever. This will create a continuous wave that will only turn of when switched off. 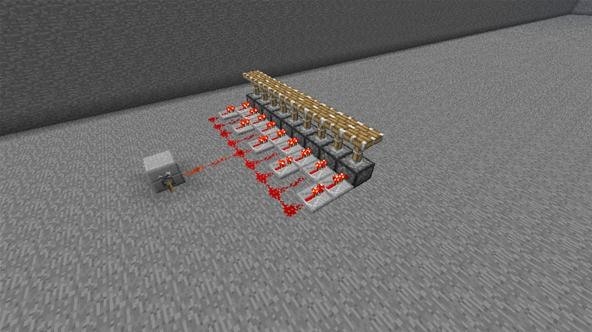 The lever's counterpart is the Redstone Torch, which functions in the same way, except can only be turned off when broken. Thirdly, the button which sends a single pulse along the redstone contraption (and is less obvious than a lever or a pressure plate). Since we're only going over the basics, I will not go into details of how a button can function as if it were a lever, but this is known as a "t-flip-flop". Fourthly, the Pressure Plate which when stepped on, sends a continuous wave until you get off of it. The last and my personal least favourite is the Detector Rail. Now, this one will actually take some lengthy explaining. 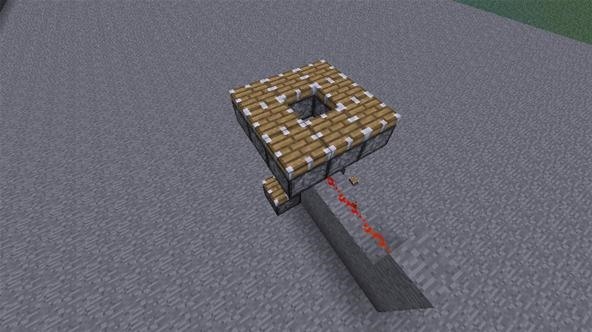 Here is how it works (see it pictured below): When a minecart is sent along a track and then hits a pressure plate, it will send of a single pulse through the contraption. 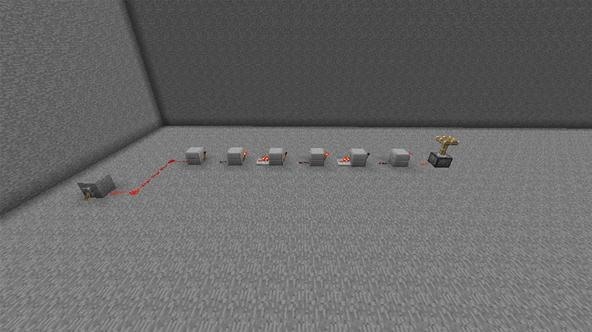 You can also use this as a method of making rapid fire arrow launchers by making loops to continuously send pulses. This is not the preferred method, however, as timing is much more difficult than with redstone repeaters (which we will get into later). 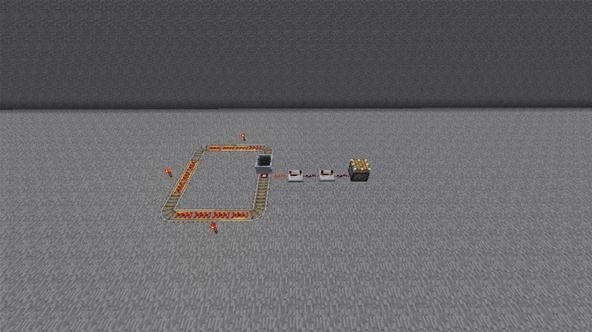 Now, a typical redstone pulse, whether continuous or not, travels a length of 15 blocks and then will run out of power in the redstone. The strength of the pulse is the same no matter how bright the redstone is along the path, but once you reach this it will stop. 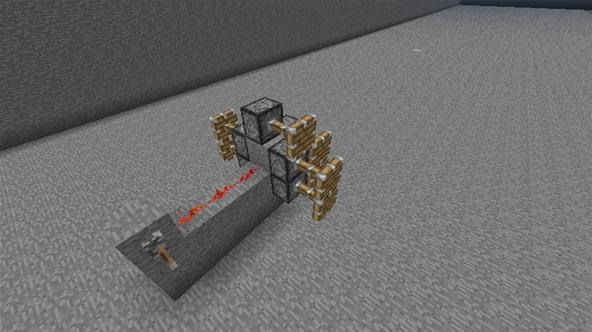 The first is through the use of Redstone Repeaters, which take a pulse and then sends out a new pulse—the same power as the original, and gives you another 15 blocks to play with. Now, it is to be noted that repeaters do actually slow pulse by 1/4 of a second on its original setting, and 1/4th more for everyone after that setting. Thus, some people who need specific timing use method number two: the Redstone Torches. 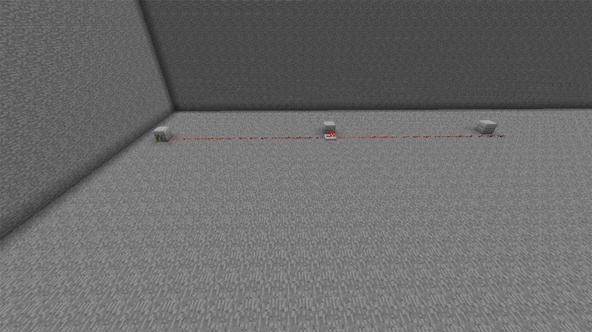 When a redstone pulse is sent through a solid object that is holding a redstone torch, it will turn it off. But if the redstone path continues to a second, it with have that torch activated and thus lengthen the pulse again. Redstone can go in as many directions as you would like, and branch off so as to activate as many different pistons or torches or noteblocks as you like. 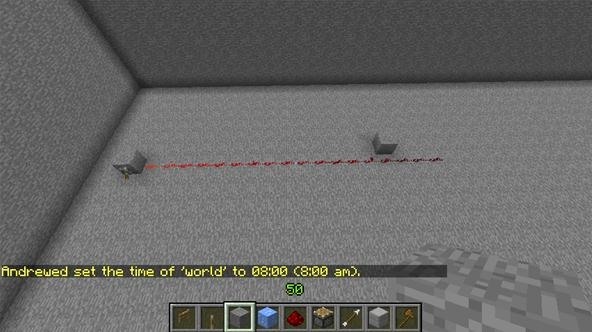 Typically branches have to be at least one block away from one another so as that they don't link, but you may also use redstone repeaters, which will only take a pulse in one direction and send it in one direction to avoid this problem. Not long ago, Jon Hook published a guide to combination locks and it seems to make it look more difficult than it really is, so I will show you the simple theory of it. 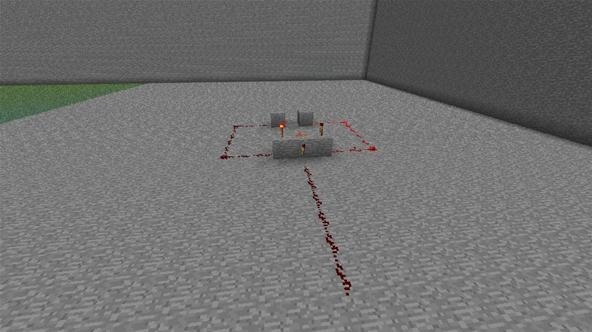 When redstone torches are introduced with one space between, connected by redstone at the same height, they will both remain active. 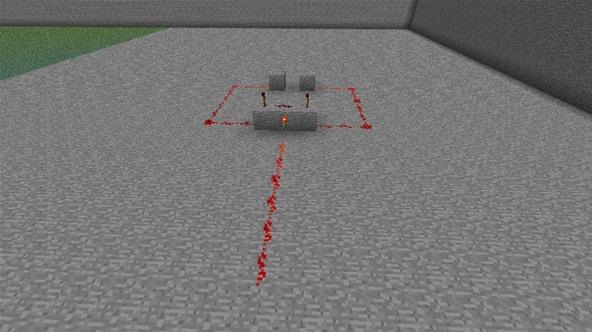 This, however, changes when a third torch is placed on the block holding the redstone charge, as it is then forced to become an opposite and will remain a negative charge. Here they are both active and thus it won't turn on. In fact, only one is actually needed to be on for it not to work. It is when both are off that a pulse is allowed to go through. This is how you can limit certain pulses from going through without their appropriate brother pulses, as well as make larger contraptions function. Do you have questions, or a request for a future how-to? Let us know in the comments section below!